What better way to celebrate passioneat’s fifth birthday (and what an opinionated young lad he’s turning out to be) than with one of Sicily’s defining ingredients, and also one of my favourites, as anyone who has been following my progress will know only too well. After the indulgence, length and fervour of the last post, today’s offering is almost Buddhist in its simplicity, not that Buddhists probably get through boatloads of raw tuna. Expect it would wreak havoc with their karma. Not with mine, I’m glad to report. To say this is old-school Sicilian would be a lie. A modern classic maybe, insofar as that actually means anything. It only started popping up on menus here about five or ten years ago, although now any decent fish restaurant will offer it. Strangely, though, it’s not the sort of thing that people serve at home. A mystery, really, since it’s quick, simple and delicious. Nor is it going to break the bank. The best I’ve ever had was at Zurro on Stromboli, one of my favourite restaurants on one of my favourite places on earth. I suspect nothing I, you, or indeed any other restaurant this side of Kyoto can muster will be able to seriously compete. Location and emotion have a huge impact on how we perceive food, so anything eaten in candlelight with the sound of the waves on the shore of a Mediterranean island, and the aroma of fish grilling over wood charcoal, is bound to taste good. Add the fact that this was the freshest local tuna, served simply, but with the best olive oil, fresh mint and the zest of Sicilian oranges. Let’s face it, the competition will be having a tough time of it. This, then, is my attempt at recreating something unrecreatable. Doomed from the outset maybe, but once you’ve savoured that first forkful, you’ll be feeling pretty good, Mediterranean island or no Mediterranean island. There is something about a tartare that lifts one’s spirits. It just exudes luxury and indulgence, which is impressive for something so easy. Tuna’s fish, so tuna will benefit from a squeeze of lemon, right? Well, yes, but even better here is orange. Its slightly mellower, fruitier citrus taste complements the meaty fish much better than the sharper lemon. It’s a combination I first tried on the island of Favignana, off Sicily’s west coast, which is famous for its tuna, and Zurro is clearly of the same illuminated persuasion. So, orange it is, not lemon. Your fish obviously needs to be raw, otherwise it’s not a tartare. Here in Italy fish to be sold for raw consumption in restaurants and sushi bars must be frozen first to kill off potentially dangerous bacteria. Mine already was, so I didn’t need to take this step, but it may be worth asking the fishmonger for advice, just to make sure. 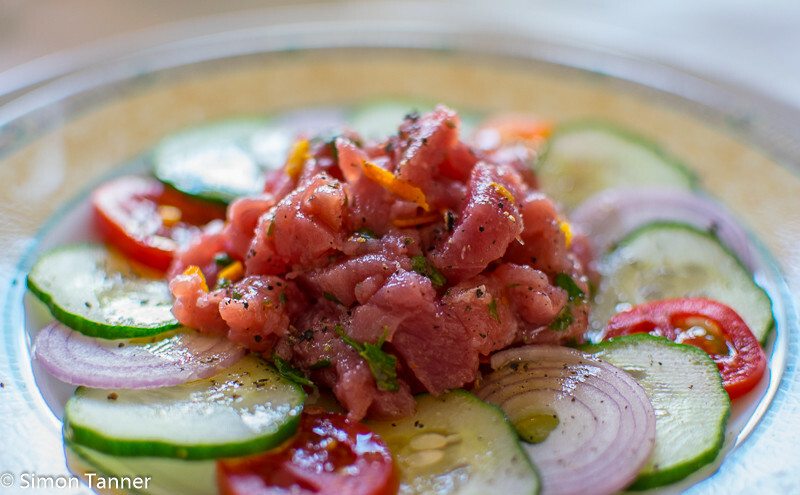 Try and get tuna fillet – you want something fairly lean and naturally tender for this dish seeing as it will be eaten raw without the tenderizing effect of heat. Use the best olive oil in existence (i.e. Sicilian); something peppery and rich, not light and delicate. The tuna can take it. Chop the tuna as coarsely or finely as you like, with the sharpest knife you have. Preferably non-serrated – you want the delicate flesh cut cleanly, not ripped. Japanese sushi/sashimi knives are perfect. 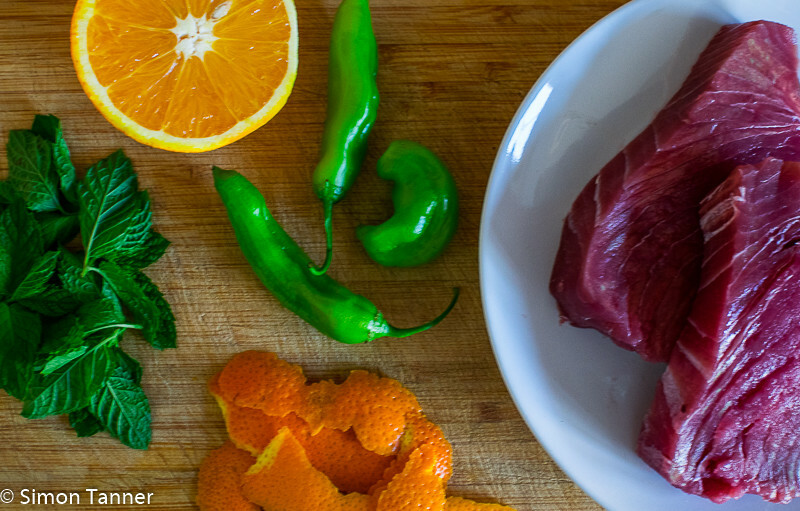 Briefly toss the tuna with the orange juice and zest, salt, pepper and chopped fresh mint. Place small mounds on plates, with salad if desired. But some crusty bread is all you really need. Grilled tuna can even be paired to good effect with a light red, but in its raw state, and considering the citrus and mint dressing, I would suggest an Etna Bianco. This entry was posted in Fish, Recipes, Salads and tagged fish, salad, tartare, tartare di tonno, tonno, tuna by hungryenglishman. Bookmark the permalink.